grab-site is an easy preconfigured web crawler designed for backing up websites. Give grab-site a URL and it will recursively crawl the site and write WARC files. Internally, grab-site uses a fork of wpull for crawling. a dashboard with all of your crawls, showing which URLs are being grabbed, how many URLs are left in the queue, and more. the ability to add ignore patterns when the crawl is already running. This allows you to skip the crawling of junk URLs that would otherwise prevent your crawl from ever finishing. See below. an extensively tested default ignore set (global) as well as additional (optional) ignore sets for forums, reddit, etc. duplicate page detection: links are not followed on pages whose content duplicates an already-seen page. The URL queue is kept on disk instead of in memory. If you're really lucky, grab-site will manage to crawl a site with ~10M pages. Note: if you have any problems whatsoever installing or getting grab-site to run, please file an issue - thank you! On Debian, use su to become root if sudo is not configured to give you access. --no-binary is necessary for the html5-parser build. grab-site and its dependencies are available in nixpkgs, which can be used on any Linux distribution. And then restart your shell (e.g. by opening a new terminal tab/window). As an alternative to the Homebrew install, if you prefer Nix. Scroll down, check "Windows Subsystem for Linux" and click OK. Wait for install and click "Restart now"
Search for "Ubuntu" in the store and install Ubuntu (publisher: Canonical Group Limited). Wait for install and create a user when prompted. Follow the Ubuntu 16.04, 18.04, Debian 9 (stretch), Debian 10 (buster) steps. To update grab-site, simply run the ~/gs-venv/bin/pip install ... or nix-env ... command used to install it originally (see above). After upgrading, stop gs-server with kill or ctrl-c, then start it again. Existing grab-site crawls will automatically reconnect to the new server. Do this inside tmux unless they're very short crawls. Note that tmux 2.1 is broken and will lock up frequently. Ubuntu 16.04 users probably need to remove tmux 2.1 and install tmux 1.8 from Ubuntu 14.04. If you are unable to downgrade tmux, detaching immediately after starting the crawl may be enough to avoid the problem. You can pass multiple URL arguments to include them in the same crawl, whether they are on the same domain or different domains entirely. warcprox users: warcprox breaks the dashboard's WebSocket; please make your browser skip the proxy for whichever host/IP you're using to reach the dashboard. Options can come before or after the URL. --1: grab just URL and its page requisites, without recursing. --igsets=IGSET1,IGSET2: use ignore sets IGSET1 and IGSET2. Ignore sets are used to avoid requesting junk URLs using a pre-made set of regular expressions. See the full list of available ignore sets. The global ignore set is implied and always enabled. The ignore sets can be changed during the crawl by editing the DIR/igsets file. --no-offsite-links: avoid following links to a depth of 1 on other domains. grab-site always grabs page requisites (e.g. inline images and stylesheets), even if they are on other domains. By default, grab-site also grabs linked pages to a depth of 1 on other domains. To turn off this behavior, use --no-offsite-links. Using --no-offsite-links may prevent all kinds of useful images, video, audio, downloads, etc from being grabbed, because these are often hosted on a CDN or subdomain, and thus would otherwise not be included in the recursive crawl. -i / --input-file: Load list of URLs-to-grab from a local file or from a URL; like wget -i. File must be a newline-delimited list of URLs. Combine with --1 to avoid a recursive crawl on each URL. --igon: Print all URLs being ignored to the terminal and dashboard. Can be changed during the crawl by touching or rming the DIR/igoff file. This is slower because it needs to find the specific regexp to blame. --no-video: Skip the download of videos by both mime type and file extension. Skipped videos are logged to DIR/skipped_videos. 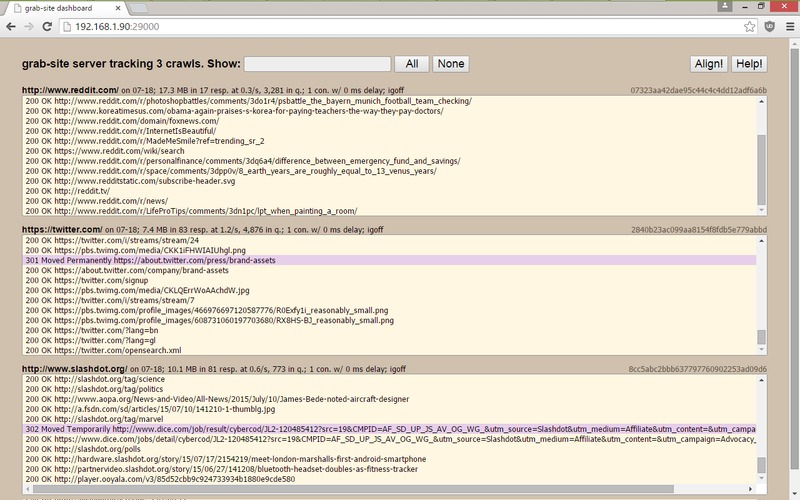 Can be changed during the crawl by touching or rming the DIR/video file. --no-sitemaps: don't queue URLs from sitemap.xml at the root of the site. --max-content-length=N: Skip the download of any response that claims a Content-Length larger than N. (default: -1, don't skip anything). Skipped URLs are logged to DIR/skipped_max_content_length. Can be changed during the crawl by editing the DIR/max_content_length file. --no-dupespotter: Disable dupespotter, a plugin that skips the extraction of links from pages that look like duplicates of earlier pages. Disable this for sites that are directory listings, because they frequently trigger false positives. --concurrency=N: Use N connections to fetch in parallel (default: 2). Can be changed during the crawl by editing the DIR/concurrency file. --delay=N: Wait N milliseconds (default: 0) between requests on each concurrent fetcher. Can be a range like X-Y to use a random delay between X and Y. Can be changed during the crawl by editing the DIR/delay file. --import-ignores: Copy this file to to DIR/ignores before the crawl begins. --warc-max-size=BYTES: Try to limit each WARC file to around BYTES bytes before rolling over to a new WARC file (default: 5368709120, which is 5GiB). Note that the resulting WARC files may be drastically larger if there are very large responses. --level=N: recurse N levels instead of inf levels. --page-requisites-level=N: recurse page requisites N levels instead of 5 levels. --ua=STRING: Send User-Agent: STRING instead of pretending to be Firefox on Windows. --id=ID: Use id ID for the crawl instead of a random 128-bit id. This must be unique for every crawl. --dir=DIR: Put control files, temporary files, and unfinished WARCs in DIR (default: a directory name based on the URL, date, and first 8 characters of the id). --finished-warc-dir=FINISHED_WARC_DIR: Move finished .warc.gz and .cdx files to this directory. --permanent-error-status-codes=STATUS_CODES: A comma-separated list of HTTP status codes to treat as a permanent error and therefore not retry (default: 401,403,404,405,410). Other error responses tried another 2 times for a total of 3 tries (customizable with --wpull-args=--tries=N). Note that, unlike wget, wpull puts retries at the end of the queue. --wpull-args=ARGS: String containing additional arguments to pass to wpull; see wpull --help. ARGS is split with shlex.split and individual arguments can contain spaces if quoted, e.g. --wpull-args="--youtube-dl \"--youtube-dl-exe=/My Documents/youtube-dl\""
Also useful: --wpull-args=--no-skip-getaddrinfo to respect /etc/hosts entries. --which-wpull-args-partial: Print a partial list of wpull arguments that would be used and exit. Excludes grab-site-specific features, and removes DIR/ from paths. Useful for reporting bugs on wpull without grab-site involvement. --which-wpull-command: Populate DIR/ but don't start wpull; instead print the command that would have been used to start wpull with all of the grab-site functionality. --debug: print a lot of debug information. If you pay no attention to your crawls, a crawl may head down some infinite bot trap and stay there forever. The site owner may eventually notice high CPU use or log activity, then IP-ban you. grab-site does not respect robots.txt files, because they frequently whitelist only approved robots, hide pages embarrassing to the site owner, or block image or stylesheet resources needed for proper archival. See also. Because of this, very rarely you might run into a robot honeypot and receive an abuse@ complaint. Your host may require a prompt response to such a complaint for your server to stay online. Therefore, we recommend against crawling the web from a server that hosts your critical infrastructure. Don't run grab-site on GCE (Google Compute Engine); as happened to me, your entire API project may get nuked after a few days of crawling the web, with no recourse. Good alternatives include OVH (OVH, So You Start, Kimsufi), and online.net's dedicated and Scaleway offerings. Log in to the website in Chrome or Firefox. Use the cookies.txt extension for Chrome or for Firefox extension to copy Netscape-format cookies. Paste the cookies data into a new file. Start grab-site with --wpull-args=--load-cookies=ABSOLUTE_PATH_TO_COOKIES_FILE. The defaults usually work fine. --ua "Mozilla/5.0 (Windows NT 10.0; Win64; x64; rv:64.0) Gecko/20100101 Firefox/64.0 but not really nor Googlebot/2.1"
Use --igsets=singletumblr to avoid crawling the homepages of other tumblr blogs. If you don't care about who liked or reblogged a post, add \?from_c= to the crawl's ignores. Use --igsets=reddit and add a / at the end of the URL to avoid crawling all subreddits. You can hover over the "Hot"/"New"/... links at the top of the page to see the correct casing. Use --no-dupespotter to avoid triggering false positives on the duplicate page detector. Without it, the crawl may miss large parts of the directory tree. Use --no-offsite-links to stay on the main website and avoid crawling linked pages on other domains. Use --igsets=mediawiki. Note that this ignore set ignores old page revisions. You will probably have to add ignores with translated Special:* URLs based on ignore_sets/mediawiki. Use a DNS history service to find the old IP address (the DNS "A" record) for the domain. Add a line to your /etc/hosts to point the domain to the old IP. Start a crawl with --wpull-args=--no-skip-getaddrinfo to make wpull use /etc/hosts. Use snscrape to get a list of tweets for a user. Redirect snscrape's output to a list of URLs with > urls and pass this file to grab-site --1 -i urls. Alternatively, use webrecorder.io instead of grab-site. It has an autoscroll feature and you can download the WARCs. Keep in mind that scrolling twitter.com/user returns a maximum of 3200 tweets, while a from:user query can return more. While the crawl is running, you can edit DIR/ignores and DIR/igsets; the changes will be applied within a few seconds. DIR/igsets is a comma-separated list of ignore sets to use. DIR/ignores is a newline-separated list of Python 3 regular expressions to use in addition to the ignore sets. You can rm DIR/igoff to display all URLs that are being filtered out by the ignores, and touch DIR/igoff to turn it back off. Note that ignores will not apply to any of the crawl's start URLs. Inspecting the URL queue is usually not necessary, but may be helpful for adding ignores before grab-site crawls a large number of junk URLs. Four other statuses can be used besides todo: done, error, in_progress, and skipped. rm DIR/scrape. Responses will no longer be scraped for URLs. Scraping cannot be re-enabled for a crawl. You can touch DIR/stop or press ctrl-c, which will do the same. You will have to wait for the current downloads to finish. zless -S will turn off line wrapping. Note that grab-site requests uncompressed HTTP responses to avoid double-compression in .warc.gz files and to make zless output more useful. However, some servers will send compressed responses anyway. If you automatically upload and remove finished .warc.gz files, you can still run into a situation where grab-site processes fill up your disk faster than your uploader process can handle. To prevent this situation, you can customize and run this script, which will pause and resume grab-site processes as your free disk space crosses a threshold value. grab-site is made possible only because of wpull, written by Christopher Foo who spent a year making something much better than wget. ArchiveTeam's most pressing issue with wget at the time was that it kept the entire URL queue in memory instead of on disk. wpull has many other advantages over wget, including better link extraction and Python hooks. Thanks to David Yip, who created ArchiveBot. The wpull hooks in ArchiveBot served as the basis for grab-site. The original ArchiveBot dashboard inspired the newer dashboard now used in both projects. Thanks to Falcon Darkstar Momot for the many wpull 2.x fixes that were rolled into ArchiveTeam/wpull. Thanks to JustAnotherArchivist for investigating my wpull issues. grab-site bugs and questions are welcome in grab-site/issues. Please report security bugs as regular bugs.